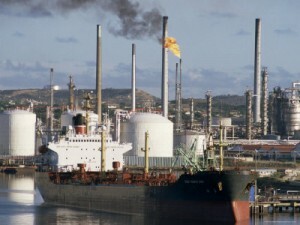 WILLEMSTAD - China's trading firm PetroChina was awarded a tender to sell up to 1.65 million barrels of U.S. light crude to Venezuela's state-run PDVSA for delivery in the coming weeks at a terminal in Curaçao, traders said on Monday. The Chinese company along with British BP were awarded a previous tender by PDVSA in March to import more than 8 million barrels of light crude this year. But deliveries have been affected by long payment delays to PDVSA's suppliers. The last cargo sent by BP from a list of 13 agreed shipments discharged at Curaçao last week after waiting for 90 days. The cargoes of 550,000 barrels each of U.S. WTI or DSW crudes, must be delivered from mid-December through January at PDVSA's Bullenbaai terminal. It was not immediately possible to know prices agreed. PDVSA did not immediately respond to a request for comment. China and Venezuela exchange a large volume of crude and refined products according to several oil-for-loan agreements involving their state-run firms, but the U.S. oil cargoes to be supplied this time will be prepaid, one of the sources said. PDVSA has been using foreign oil to dilute with its own extra heavy crude output and to feed its Caribbean refineries since it started crude imports in 2014. So far this year it has bought some 12.1 million barrels of U.S. and Nigerian light crudes, versus 16.9 million barrels of African and Russian oil imported in 2015.